Please if you don’t mind, put your answers as comments on this post. You can of course also put them all together as a post on your own blog, but it’s easier for the conversation if we can centralize all our answers, so that we can comment on each other’s answers. Thanks! 1. Duty is very important to the youthful Grace. Did Grace’s sense of duty contribute to the novel’s conclusion? If so, how? Would things have turned out better for the characters if Grace had made different decisions? 2. Why again the mention of guilt on Grace’s part? Do you think she could be over reacting? 3. 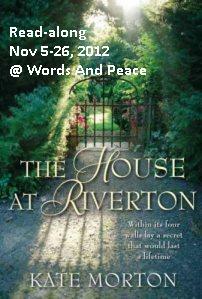 Do you think of The House at Riverton as a tragic novel? 4. How important to the novel’s outcome is Grace’s longing for a sister? When Grace finds out about her true parentage, why does she choose not to tell Hannah? Is it the right decision? Would things have ended differently had she done otherwise? 5. The First World War was a catalyst for enormous social and cultural change. Not a character in The House at Riverton is left untouched by this. Whose life is most altered? Why? 6. Is there a heroine in The House at Riverton? If so, who is it and why? Here are my questions to help you read Part 3. 1. What are your impressions on Deborah? 2. What do you like most in this chapter? 3. So by now, we know why Mr Frederick is watching in the cemetery, right? This seems to confirm what I found in the Fall of Icarus, part 2. Do you see what I mean? 4. What do you think about the scene between Grace and Alfred?? 5. “There was no choice.” p. 448. Do you agree with these last words of part 3? Was there really no choice for Grace. Would you have made the same decision?